The smell of wet canvas, the sight of muscular men hauling ropes and the sounds of animals that aren’t normally found in Southwest Nebraska are just a few of the odd memories that came flooding back to me last week. 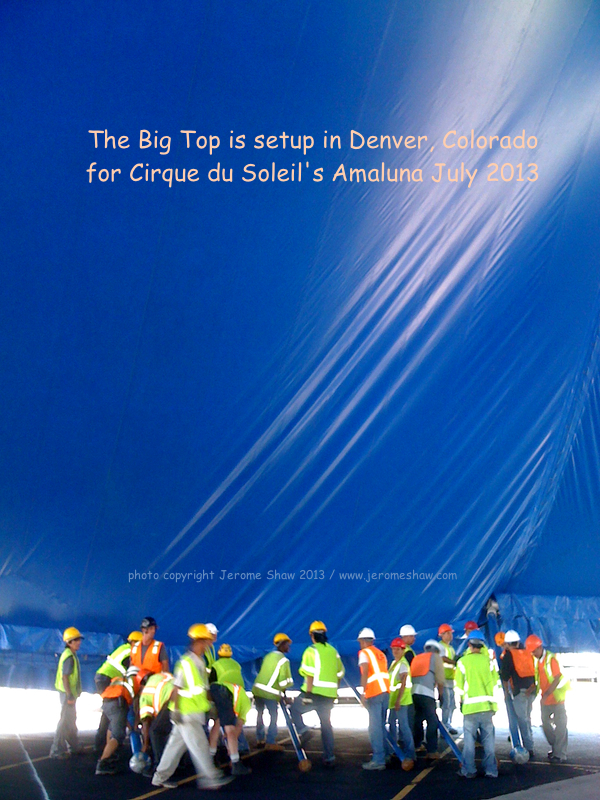 I was invited to watch the blue and yellow Big Top being raised in the parking lot south of the Pepsi Center in preparation for Cirque du Soleil’s traveling show Amaluna, which opens in Denver July 18th. My behind-the-scenes peek into what goes into preparing for a Cirque show gave me more than just insight into how many people and how much stuff it takes to create one of these high-flying acts. For a few moments I was transported back to when I was a child and a traveling circus would come to visit my small town. They didn’t come every summer and long before I was grown they stopped visiting such hamlets as mine. I still got go to the circus but we had to travel 30-40 miles to see it. Lost was the opportunity to hangout in the background and watch the circus being setup, which, for 8-9 year old boy, was nearly as thrilling as the performance itself. While much has changes since the more traditional traveling circuses visited my tiny village it still takes a bunch of strong people (more than 60) and lots of cables, ropes and 100 support poles to create the space for the performers of Amanluna. 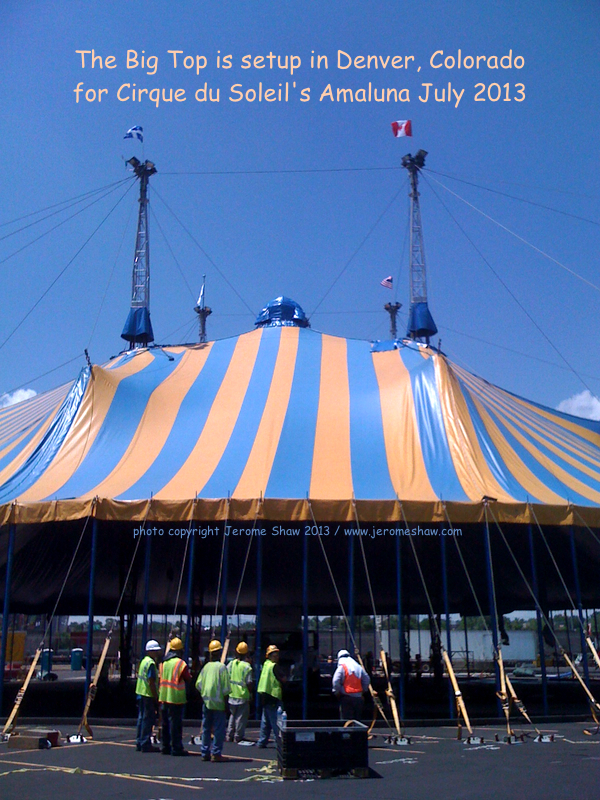 The 19 meter high Big Top takes 8 days to erect (2 days to tear down) with its 4 − 25 meter masts it seats over 2,600 people. The tent is now made of high tech fabric with a interior structural design that can withstand winds of nearly 75 miles per hour. But the excitement preparing for the big show is still here. 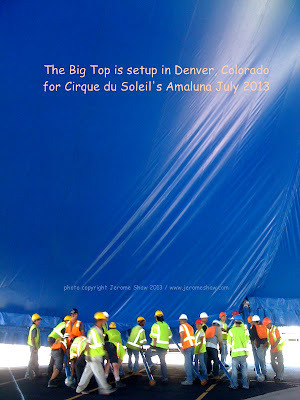 And, once the last section of the Big Top was pushed up and the stabilizing poles in place a cheer when up among the workers. Amaluna opens tonight in Denver and runs through August 25th I’ll be there tonight and I’ll feel a special sense of connection to this Cirque du Soleil having had the chance to recapture my youth and see what goes into the making of a modern circus. Watch for my review of Amaluna in the next couple of days.